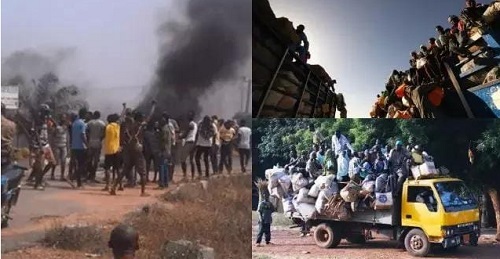 Few days after the violent clashes between Hausa and Yoruba communities in Ile-Ife, a fresh communal clash has broken out in Osun state. According to Vanguard, the clash broke out on Friday, March 31 in Ife North Local Government Area of Osun. No fewer than 10 people were injured in the fresh violence. Investigations revealed that the fresh clash was between the people of Ipetumodu and Asipa in Ife north area of the state. According to an eyewitness account, the clash started on Wednesday evening shortly after an alleged misunderstanding that broke out after an inter house sports football competition in the Community High School Ipetumodu, not far away from Asipa. Youths from both communities were allegedly involved in the fight. Some unidentified youths were said to have taken advantage of the face off between the students and set ablaze the popular Akinola Market in Asipa, a development that escalated the crisis between the two communities. Gunshots were reportedly fired into the air to heighten tension in the area and no fewer than ten persons sustained injuries. Policemen arrived later to maintain law and order. According to one of the traditional chiefs who spoke on condition of anonymity, Asipa community was to blame. He alleged that the other community turned a mere school riot to community clash to burn the market. He also alleged that this was not the first time that such attack would be carried out against his people. However, a leader of Asipa community, Julius Ogerinde denied the allegation saying that they were aggrieved because of the government white paper on the disputed land which favoured the other community. “They only used the avenue of the Inter house Sport competition to perpetrate their grievances and three of our people were shot,” he said. When contacted, the police spokesperson, Mrs. Folashade Odoro confirmed the clash, saying policemen had been drafted to the area to maintain law and order and normalcy has since returned to the area.